Island hopping "light" stands for a smaller ( and of course cheaper) version of Boracay Island hopping. As opposed to include Carabao Island, the route leads anlong the smaller islands near Boracay. It's a kind of trip for people, who do not like sailing on the open ocean. For people who feel better, seing the land very colse to the boat. Basically there is very little chance that waves get high and it's completely relaxed sailing. The tour is designed for folks who just want to have fun, as well as for familys with kids and people of progressed ages. Some kids dont like the open ocean, some older people also don't. Therefore we offer "Island hopping light". 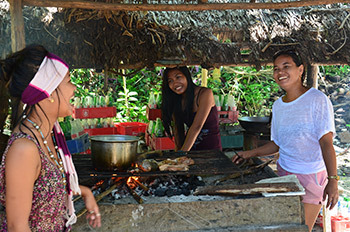 What makes a big difference to our trips going to Carabao Island is, that the islands near Boracay are a little busyer. Means, you can make new friends to even enjoy a great time together - if you like. You decide where to go and how long it should take. 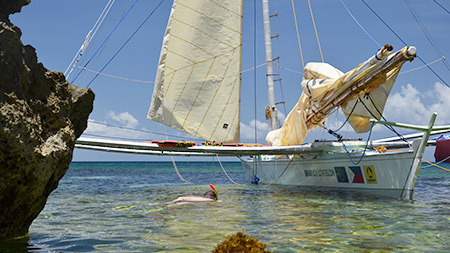 All in all it is a cool little trip to do with "Boracay Sailing" . It's still very different, 'cause you go on a sailboat with only very few people. So it is the most individual way to see the islands near Boracay. Ther are possibilitys for grilling as well as table to sit at for lunch. 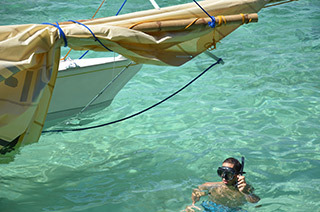 Also there are snorkeling areas to enjoy Boracay's beautyful underwater world. You don't have to buy or rent snorkeling gear. We have it on board. Just let us know with your booking inqiry, for how many people you need it - we will be prepared for you. 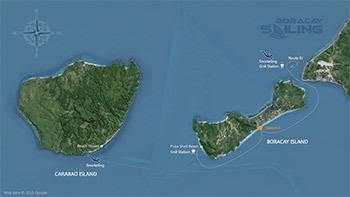 Click for map "Island hopping light"